One of the nights last week we had the single guys over for stir-fry, wine and beer, and treats. One of our classmates got lost in the woods (so we thought) and the party got off to a late start. We had a great time and I kept the party going late with a heated ethics discussion with another classmate. Go figure! 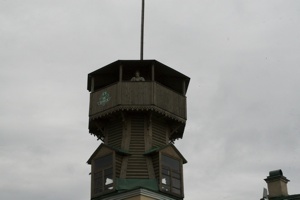 On Saturday we drove to Tomsk. 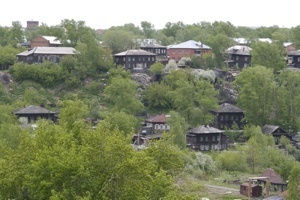 It is one of the two oldest and largest cities in Siberia. Novosibirsk where we are staying is larger but is only 120 years old. 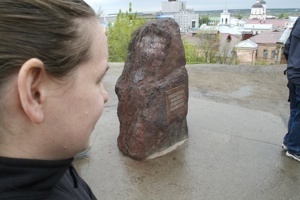 Tomsk was founded over 400 years ago. I didn’t know that Siberia wasn’t explored until the early 17th century. At one point it was unknown whether China or Russia would settle the territory. Russia made a big push and assimilated the whole of Siberia to the East in less than 100 years. Their expansion east is very similar to our expansion west. Tomsk is about 250 Km from Novosibirsk. Our drive proved our preconceptions that Siberia is a big, open space. Most of the drive was unsettled and not even farmed. The roads are horrible but better than the roads of Novosibirsk. Very bumpy and full of holes. It doesn’t help that the fines for speeding are low ($1.50 for up to 20 km over and $2.50 for up to 40-50 km over.) Everyone speeds. In a nice stretch of road we were going 150 km per hour. Thank goodness my motion sickness seems to have diminished, even on the flights I was okay. The drive did treat us with some interesting sights. The cemeteries all use fences around the grave sites. People bring food and vodka throughout the year for their deceased. This is driven by old pagan superstitions which have persisted. The landscape is mostly birch trees but as we moved northward this transitioned to fir trees. 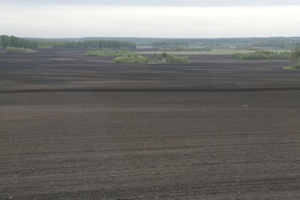 Here is a photo of some of the farmed land to give you an idea of the landscape. 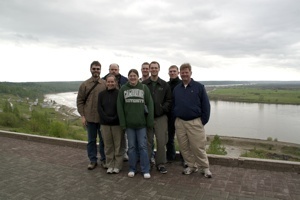 When we arrived in Tomsk, we proceeded to the historic fort on the bluff where it initially began. Jim and the Tar-tar warrior. The city was settled by the Tar-Tar after defeating the Khazak. 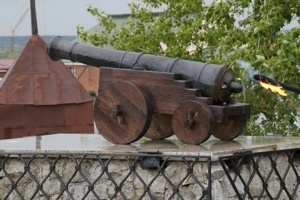 The stone, the tower, and the canon are all icons of Tomsk. 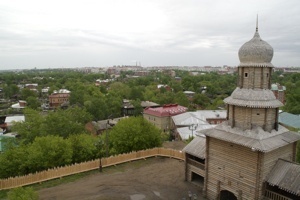 This is a view of first the modern cityscape and the ancient with its wooden houses. The city is a blend of two. Many modern buildings are being raised. The city embraces its past and has kept many of the modern buildings. 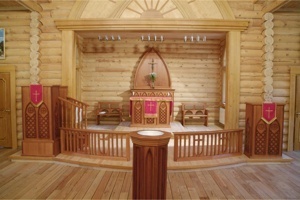 This is the house that served as the original mission building for St. Mary’s in Tomsk. They have sold the building and it once again is a residence. The Russians love their monuments. 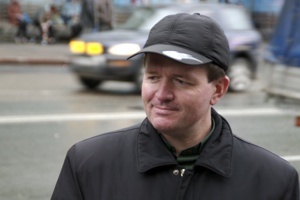 Particularly famous is the Tomsk playwright Chekhov. We travelled to the historic district of town. 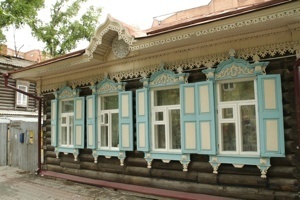 Here we saw many of the original wooden buildings Tomsk is known for. 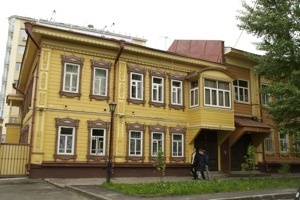 These buildings helped Tomsk earn the nickname “New Vienna.” The town is about 500,000 in population, 100,000 of which are students at one of its six major universities and many smaller universities. Novosibirsk (especially Akademgorodok) has leapfrogged it as the education center yet many students remain. Particularly important for our trip was a visit to St. Mary’s Lutheran church. After the fall of the Soviet Union, Russia handed its churches back over to their original owners. Unfortunately, the original church was bombed during some war. 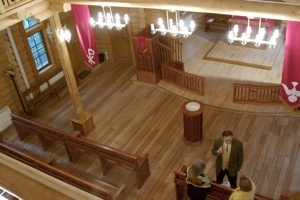 For the visit of German Chancellor Angela Merkel in 2004, the city rapidly built this church and returned it to the Lutheran church of Tomsk. The original hand been stone and larger but they needed to complete it as quickly as possible (in the middle of winter.) 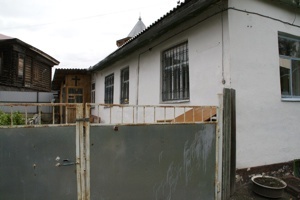 Many german Lutherans were deported here from Western Russia during the wars and the congregation continues to serve both Russian and German speaking people. 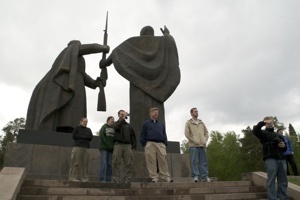 Our last stop was a visit to the bank of the Tom river and the famous “Mother Russia hands the Son of Russia a gun” monument. Here you can see our whole group standing on the bank. 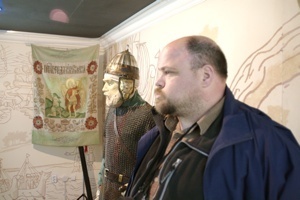 Many thanks to our guides for the tour including Pastor Daniel and Deacon Aleksander. 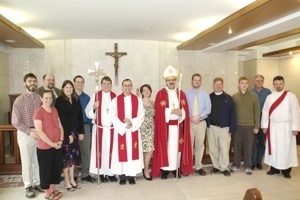 On Sunday, we attended church at the Seminary where St. Andrew’s congregation meets. We were privileged to be there for the ordination of one of their deacons into the pastorate. For the occasion the newly-consecrated Bishop Litkin officiated. 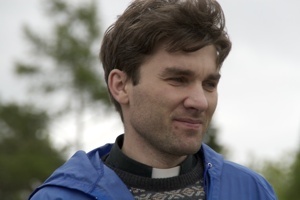 This is a historic time for the Lutheran church of Siberia as they are rebuilding from seventy or more years of oppression. 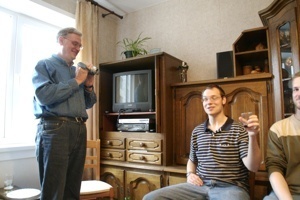 In the middle photo you can see two of our goofy classmates Vladimir and Victor 2. Chris, thank you for taking the time to write during your long, busy days in Russia. 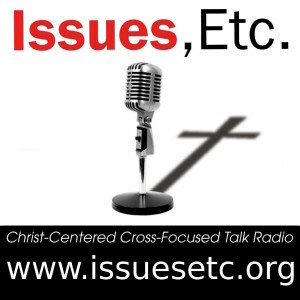 It is very interesting and the pictures are great!God’s blessings on your next week. What does Anne do while you’re in class?